Even if the technology improves, I have a horrible feeling that Pixar won't be able to top the Toy Story films in terms of either character depth or inspired story telling. While much better than the vast majority of films that pass for family entertainment these days, both A Bug's Life and Monsters Inc lacked the spark of originality and imagination that the Toy Story films had. Having said that, Randy Newman produced his most enjoyable Pixar score for A Bug's Life filled with half a dozen memorable themes and a generally more coherent style. For Monsters Inc the jazz quota is upped considerably, as is the Carl Stalling instant changes in musical direction. If I Didn't Have You (not to be confused with the equally enjoyable song of the same name from the otherwise dire - save for Patrick Doyle's score - Quest for Camelot) here performed by Billy Crystal and John Goodman didn't really strike me at first. It certainly doesn't have quite the same high impact melody of his previous songs or the strong structure. The performance and arrangement save it from being too disappointing and it has certainly grown on me, but is still a far cry from the similar Time of Your Life from A Bug's Life. The few jazzy/big band renditions do work very well, notably in Monsters Inc, forming the main title music. The extension of the big band style to quite a few other cues is great fun even if it does have a strong whiff of familiarity about it. The regular orchestral underscore follows much in the same vein as the Toy Story scores, following almost every little pratfall on screen. Sometimes it's fun and other times it's wearing, particularly in the middle portions where it does occasionally seem to simply be scampering around with no purpose. However, during the final few cues from Randall's Attack and the exciting Ride of the Doors, it starts to re-focus and become genuinely thrilling and very rousing with Newman mixing jazz and full orchestral passages quite ingeniously. Another highlight is the lovely little melody for Boo which is similar in style to some parts of Pleasantville and while it doesn't appear often, is a delightful respite. 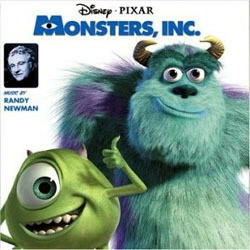 Newman is the consummate craftsman and on that level his work is never less than well wrought and while that's a little close to damnation through faint praise, Monsters Inc is unfortunately unlikely to find a place in the paean of great Randy Newman scores. One distinct problem here is that the album is at least a quarter of an hour too long. Several of the fairly uneventful middle cues could have been missed to prevent it losing too much direction which it frequently tends to. As a Randy Newman fan it's still a generally enjoyable effort, but the more skeptical will probably find it less enjoyable than his previous Pixar efforts.